For the Homage to Cataluña shoot, we’d decided to make British tapas, as an amuse bouche, for all the people taking part. Before lunch, at the Kiosk Universal, we’d gone to a carnisseria (see above) in the Boqueria to buy a beef roasting joint and butifarra, with Alfredo. I believe Alfredo shops here on a regular basis and the butchers were very helpful. 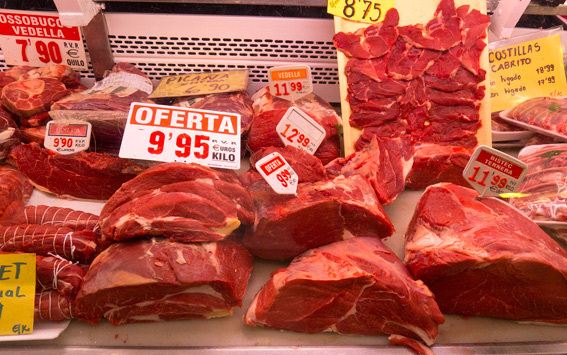 Spanish cuts of meat do differ from those of Britain, so we needed help. 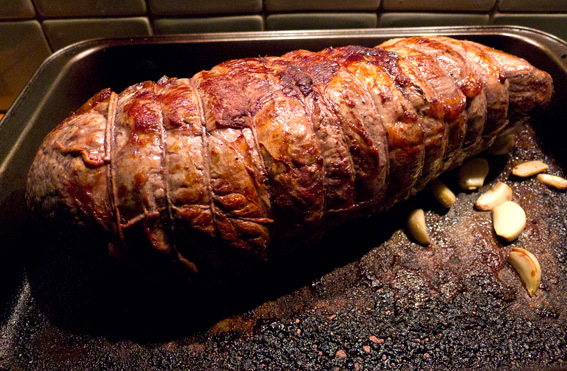 We bought a 2.5 kilo roasting joint and 2 or 3 kilos of butifarra (a traditional Catalan sausage – which compares favorably to Cumberland sausage). Alfredo took charge of the sausages and I got the beef. I browned the beef all over in Oli’s griddle pan, then roasted it for 40 minutes in a preheated oven at 200º C. Beforehand I deglazed the griddle pan with a glass of red wine and a splash of sherry vinegar and poured the deglaze over the beef before seasoning it with salt and pepper. I also added a few pieces of garlic for flavour. 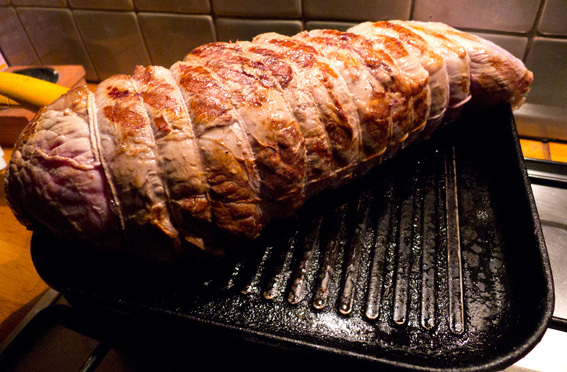 After the allotted 40 minutes, I left the beef to rest before wrapping it up and putting it in the fridge for tomorrow. I didn’t waste the juices and burnt bits in the bottom of the tray – they were turned into gravy. 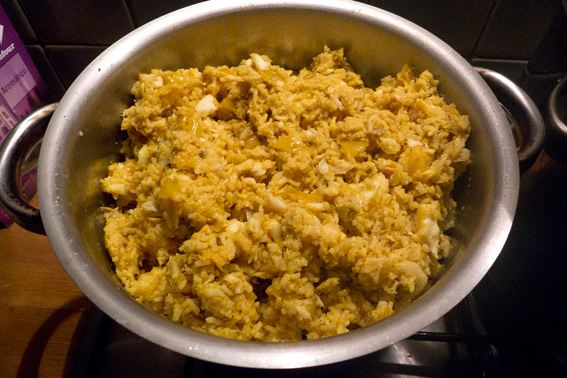 Meanwhile, I’d brought 1.5 kilos of smoked haddock from England (it’s not common in Spain) to make Kedgeree, a popular Victorian breakfast dish made with curry, rice, smoked haddock and hard boiled eggs. 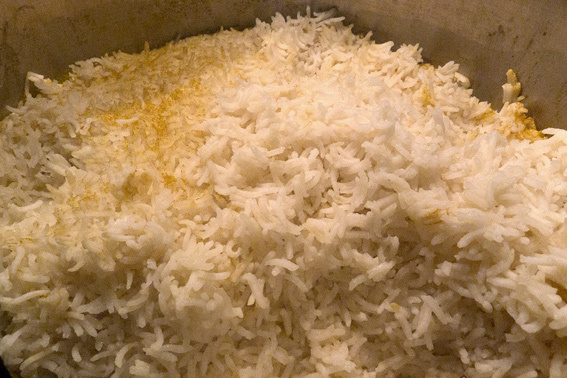 I poached the fish in milk and then once it was cool, used the milk to cook (and flavor) 1.2 kilos of Basmati Rice. I also fried 4 large Spanish onions gently, until they’d caramelised. Once everything was cold, the onions were stirred into the rice along with two large teaspoons of Madras Curry Powder. I also removed the skin from the fish and flaked it into the rice. 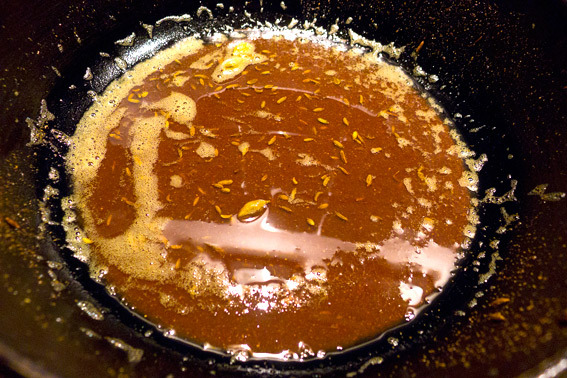 I heated some cumin, 4 cardomom pods, madras curry powder and turmeric in a frying pan, once it started to release odors (it shouldn’t cook or burn) it was done, so I poured on lots of olive oil and warmed that to infuse it. Some of this was added to the kedgeree for flavour and the rest got kept for tomorrow. This entry was posted in Barcelona, Fish, Food, Meat, Recipes, Shopping and tagged Basmati Rice, Butifarra, Cardomom, deglaze, kedgeree, La Boqueria, Madras Curry Powder, roast beef, smoked haddock, turmeric. Bookmark the permalink. 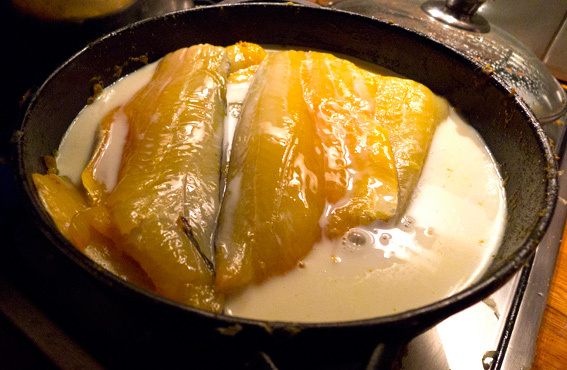 Love the kedgeree – very convincing work with cardamoms and turmeric – how did you get smoked haddock to Spain? Please not in your suitcase. It was vacuum packed and I wrapped it in a cold bag, then newspaper. Buying it loose wasn’t an option under the circumstances. Glad to see you finally all buckled down and did some work after all that bar crawling! I was beginning to expect a post that said the shoot didn´t happen due to the indisposition of those in charge 😉 Haven´t had kedgeree for oh so long, must make some. Looking at Roger´s comment above I´m now curious too…vac packed perhaps in the suitcase?! Frozen? I always put loads of bacon in my case and it seems to survive ok! Smoked fish, bacon, black pudding, chorizo and manchego seem to travel quite well. 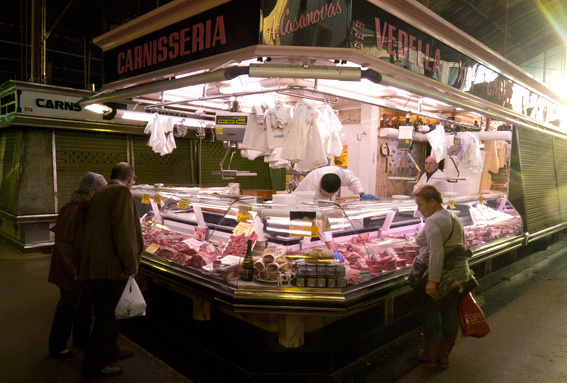 I’ve noticed in the Boqueria, that all the cheese and cured meat stalls have vacuum packing machines these days. Oli even brought back a piglet from Spain last Easter – I thought he’d get arrested for smuggling a body! Must tell my parents about that as whenever they come over for special occasions they request Suckling Pig! I really miss smoked fish liked haddock and mackerel – that kedgeree looks so delicious, and I loved the flavoured oil too. Never heard of making it, must give it a go. I have spices I bought ages ago, so would be good to use them. I am intrigued by your mentions of “the Homage to Cataluña shoot” – what’s that all about? A documentary you’re filming? Or is it a secret (other than being name-checked on your blog)? Oops, sorry, just saw your reply to a comment of mine re Homage to Cataluña on a previous post – please ignore!